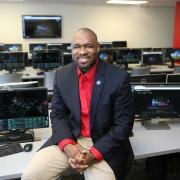 Illinois Tech is excited to announce the addition of Maurice Dawson, Ph.D., D.C.Sc., SMIEE as faculty in the Information Technology & Management (ITM) department under the School of Applied Technology. Dawson joins as an assistant professor in the ITM department primarily focused on cybersecurity and forensics education. He will also serve as the Director and Distinguished Member of the Illinois Tech Center for Cyber Security and Forensics Education (C2SAFE). He earned his Ph.D. from London Metropolitan University in 2017, his D.C.Sc. from Colorado Technical University in 2009, an M.B.A. from Colorado Technical University in 2010, an M.S. from Colorado Technical University in 2006 and a B.S. from Athens State University in 2004. Prior to joining Illinois Tech, he was a tenure track Assistant Professor at the University of Missouri-Saint Louis and a visiting professor at universities around the world including Polytechnic University of Puerto Rico and the University of Nairobi. Dawson is a member of the Association of Computing in Machinery (ACM) and senior member of IEEE, among other associations. He is an accomplished author and three time Fullbright Scholar with grants awarded from 2014-2018. His research interests are in advanced cybersecurity principles, Internet of Things (IoT) and software assurance. Aside from his educational accomplishments and career, he has over eleven years of experience working in industry and has proudly served in both the Army and Navy Reserves as well as working with government agencies such as the Defense Intelligence Agency, National Security Agency and the Department of Defense. Dawson has earned the Silver President's Volunteer Service Award from Winrock International and Catholic Relief Services in support of USAID for executing multiple IT assignments in Senegal and Ethiopia for the years of 2016-2019. Please join us in welcoming Maurice Dawson to Illinois Institute of Technology!